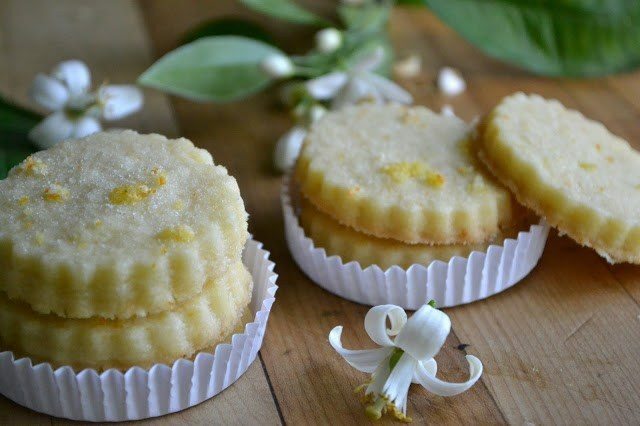 Orange Blossom Shortbread is an easy, buttery, and unique, shortbread cookie. These cookies go perfectly with afternoon tea, and they make a beautiful gift. Cream the butter and sugar together until fluffy. Be sure to pack down the orange sugar when you measure it, just as you would with brown sugar, since it will have fluffed up during the processing. Add the flour and orange blossom water and mix until a soft dough forms. Turn out onto a floured surface and bring the dough together into a smooth disk. Add a little more flour if the dough seems excessively sticky. Wrap the disk in plastic and refrigerate for about 30 minutes. Roll out the dough on the floured surface to anywhere from 1/4 to 1/2 inch, depending on how you like your cookies. Cut the shortbread with any shape cutter you like; I used a 2 inch biscuit cutter with fluted edges. Place the cookies on a parchment lined baking sheet. Return the sheet to the refrigerator for 30 minutes. Bake for about 13 minutes until firm but not browned. Let the cookies cool on the pan for a minute, then transfer to a rack. To make the orange sugar, put the sugar, zest and extract in the bowl of a mini food processor and pulse until everything is combined and the sugar is a uniform pale orange color. I shake the machine between pulses a few times to redistribute the sugar and make sure everything gets evenly mixed. Use half of this mixture for the cookies and reserve the other half. You'll have more than you need, so you'll have leftover to sprinkle on buttered toast, or in tea.